This NHL Monday features the same basic schedule as Saturday. First off, let me remind you of the Votts media list and a few links to follow on this edition of NHL Power Plays. DFS players take notice of any and all changes. If you have any questions at all, don’t hesitate to contact me on our premium Slack chat, or you can contact me on Twitter @ChrisWasselDFS. The picks below cover the Monday night slate. FanDuel and DraftKings are running the full four-game slate. Nathan MacKinnon ($7,000) — MacKinnon is $8,600 on FanDuel but little of that matters now, because I’m expecting a high-octane Game 3 is likely between Colorado and Calgary. Colorado’s top line gives as good as it gets when it comes to generating high-danger chances and slot shots. 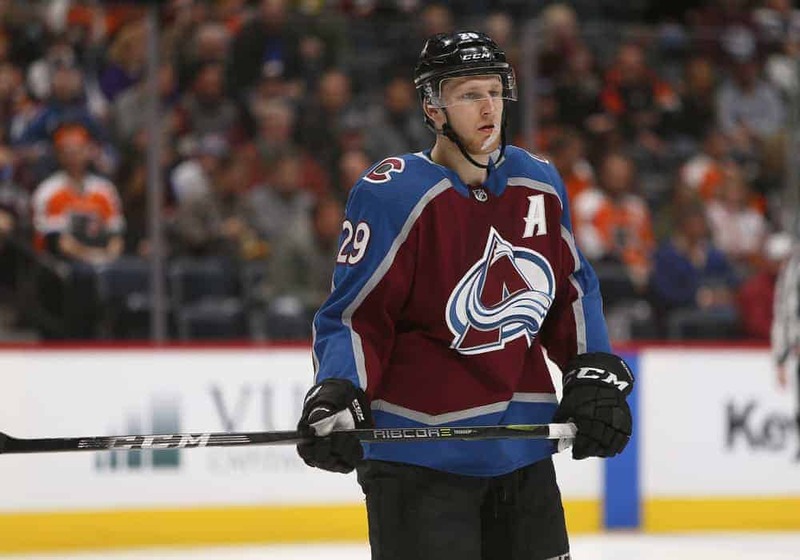 MacKinnon and Mikko Rantanen become solid plays on this night with the expectation of a full 100% Rantanen. The Colorado power play looked good in Calgary and that could be a story line to watch as well. Mitch Marner ($6,300) — Marner is the answer to who is the one player Boston has trouble defending. Overall, the winger now has 29 points in 21 meetings against the Bruins. This includes over a third of those points from special teams. The problem is Boston does not have a shutdown pairing that can slow down a player of Marner’s caliber when he is on his game, which is partially why Marner’s price has spiked to $8,400 on FanDuel. He generates tons of chances and maybe Toronto’s best player versus Boston. Even on Saturday, Marner had four scoring chances generated including two high-danger ones. Dougie Hamilton ($5,400) — Hamilton rolls on with a five-game point streak which includes two goals and four assists. His floor is almost at five shots and blocked shots per game now. The only problem is that Hamilton draws second-unit power play time. It could be worse. He shoots the puck at a high rate and his shots often lead to rebounds. Carolina should get a boost much like Washington did from their home crowd. Expect a faster start from them and Hamilton to be heavily involved. Alexander Radulov ($7,100) — Radulov’s home splits are rather impressive. This includes 40 points in 34 games along with a slightly higher shot and chance output. The fact that he averages more than half a shot a game higher at home is significant. The power-play points are nearly the same but again the 16 goals in 34 games must be mentioned. Furthermore, Dallas should be able to dictate play a bit better than they did during Game two in Nashville. This would lead to more shots for Radulov and better line matching should get Radulov up against Nashville’s depth. Jordan Staal ($4,400) — Generally, Staal has gone under the radar but he does have three points (two goals) in his last three games. The forward returned with a much clearer focus in his game and it shows. He generates better chances and uses his body to shield defenders efficiently. Even on the power play, his net-front presence creates opportunities and his above average release is an asset. His FanDuel price is just $4,800 which is a little low given his improved level of play. William Nylander ($4,500) — This is all about taking advantage of the low DraftKings price again and again. Nylander has 37 shots in his last ten games and will look to improve on what was a disastrous Game 2. Nylander, like many of the Toronto forwards, got caught up in the physical aspect of the game instead of just skating. When players like Nylander just skate and focus, they present huge matchup problems for Boston. If Toronto watches Game 1, they should have a much-improved Game 3 and that includes Nylander especially. Nylander is only $5,400 and has six points in his last eight games. Jamie Benn ($5,000) — Goals are king in DFS GPP’s. However, shots on goal do not hurt either, especially with the potential for long overtime contests. Benn averages over three shots a game at home and has 15 goals in 40 games there. His price reflects a nice discount that does not take into account this nice little home boost. The winger is riding a modest three-game point streak. Also, his shot volume should again improve along with scoring chances. This is a DraftKings only play because of a big jump in FanDuel price. Sam Bennett ($3,600) — Bennett went into the abyss but seems to have climbed back out. He played over 15 minutes in Game 2 and even delivered two assists and several scoring chances. It would not be a surprise to see Bennett garner more ice time for the Calgary Flames going forward. Lucas Wallmark ($3,100) — The center tallied points in three straight games and though shots are hit and miss, Wallmark at least creates some chances in that middle-six for Carolina. His price is low enough that poor performance should not sink things too badly. Typically, this is a true definition of a punt play. Danton Heinen ($3,100) — The value play of last season has two goals in his previous three contests. He fired eight shots on net with 15 attempts in that span. The more physical Boston plays, the more it seems to open up space for players like Heinen. Furthermore, Heinen fills the slot well and can either let the play come to him or pursue the puck. His instincts are solid when his game is on. The concern lies in the fact that he is streaky. On the other hand, at this price, the winger is cheap regardless. Looking towards the lesser goalies tonight might actually pay off in GPP’s. Do not stray too far from what works. Ben Bishop as a GPP play again is not a bad idea and Philipp Grubauer is quite cheap given the fact that Colorado is the home team on Monday night in Game 3. For bigger risks, Petr Mrazek is the cheapest starter on the slate and also is, you guessed it, at home. Again, confirmations are a different animal in the playoffs. Most “starters” will play barring something unforeseen. As of now, all starters from Game 2 will play in Game 3. The slate offers up a few ways to get fancy. Value is surprisingly abundant even in net. Mrazek is $7,000 on DraftKings which is just something else. More picks and choices will be available on Slack and social media later. The key for Monday is patience with the NHL Power Plays. Teams to pile on the rabbit I mean stack on Monday. This is important due to some under the radar stacking chances. Best of luck on Monday! This expects to feature a lot of unexpected, slate wise. Let’s do that playoff hockey!